During a post-landing NASA press conference, the astronauts on the International Space Station called down to congratulate the mission team and said they “got some goosebumps” watching the coverage. 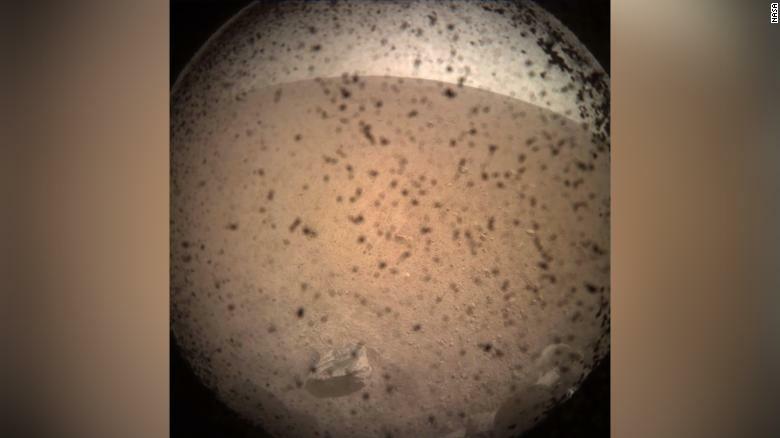 The first image taken by InSight includes the dust cover still on the lens. The black specks are dust, and there’s a rock in the left foreground. To the right is one footpad of the lander. Later Monday, mission scientists should be able to confirm that the spacecraft’s solar arrays have unfurled. InSight will unfurl its solar panels and robotic arm and study the entire planet from its parking spot. It’s along the Martian equator, bright and warm enough to power the lander’s solar array year-round.